Specs: Summit elevation: 2000′; Base elevation: 970′. 5 Lifts: 2 doubles, 1 t-bar, 1 carpet, 1 surface tow. Uphill Capacity: 4400/hr. Terrain Mix: 28-48-24. Longest Run: 13,200′. Season: usually December through late March/early April. Friday evening skiing until 6:00 pm. Annual Snowfall: 115″. Snowmaking: 70%. The SKInny: See all those people waiting in line over there at Sunday River? Did you know they only have another 370′ of vertical for all that waiting? Can you believe those prices over there? And those crowds! There must really be something wrong over here at Abram…snow seems good, no lift lines, great value. A dozen different ways down the mountain isn’t huge, but it’s not bad. Guess it’s just not as fancy as Sunday River. OK, OK, we pick on the Riv too much. Sunday River is great, no question, but those of us from the “old school” head to Mt. Abram on Saturdays and holidays. Fact is Mt. Abram has a terrific local vibe, and it skis much bigger than it is. Terrain is challenging, and just long enough. For added fun, the trail names all have a Rocky & Bullwinkle theme. The SKInny: This is one of many community-owned, volunteer-run ski areas scattered across Maine. It’s old-school, throwback, and we love it. If you are in the Skowhegan area, do yourself a favor: drive a few miles north, buy a ticket, make a few runs and re-discover the real joy of skiing. Specs: Pony lift and handle tow, no snowmaking. Novice/Intermediate ski hill. The SKInny: Maine skiing by Mainers, the way it should be. Built as a backyard, family-use tow, evolved into a legitimate small ski area. Re-named for a larger “lost” ski area that was located in the area. Lift ticket revenues probably don’t really cover expenses…this is New England community skiing at its best. Spend a morning here sometime. Update: Operational status unknown. Specs: Summit Elevation: 1610′; Base Elevation: 650′. 5 Lifts: 1 Triple Chair, 1 Poma, 1 Double Chair, 1 Handle Tow, 1 Carpet. Uphill Capacity: 1800/hr. Terrain Mix: 20-50-30. Longest Run: 6,000′. Season: usually late November through April. Night skiing Weds-Thu-Fri. Annual Snowfall: 100″. Snowmaking: 65%. The SKInny: A Cinderella story. Big Rock was a typical small New England ski area: Not big enough to compete with the Sugarloafs and Sunday Rivers, not enough money, much too far out in the sticks to be a “destination.” In swoops a grant by a Portland foundation and the purchase by Maine Winter Sports Center…and small town skiing is saved in this case. Calling it “small” is a bit misleading; at 980′ Big Rock belongs solidly in the “mid sized” category, and delivers it with good skiing and quality services. Ideal for families, but really for intermediate types, especially skiers overwhelmed by the aforementioned monster resorts. The wanderer will run out of steam quickly, but the hotshot will rule the potato patch. It’s a “must visit” for true skiing enthusiasts. Big Squaw — 2013 — Back in Business!, Greenville • unknown skiable acres on 1650′ vertical. The SKInny: At one time a huge, terrific ski area, more recently a huge, dysfunctional ski area that went out of business for about ten years. Now the “Friends of Big Squaw” have re-animated the mountain, refurbishing lifts and doing fundraisers and making things happen. Right now just the lower mountain is lift-served, but hey, it’s awesome that they’ve come this far. If you have the opportunity, get to Big Squaw, lend a hand, or at least buy a ticket (2018-19 top ticket price is $30, very cheap) and make a few turns. We’ll update as things continue to progress. Specs: Summit Elevation: 2150′; Base Elevation: 1000′. 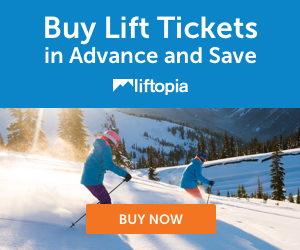 5 Lifts: 1 Triple Chair, 2 Handle Tows, 2 Chair lifts, 1 T Bar. Uphill Capacity: 5000/hr. Terrain Mix: 20-50-30. Longest Run: 4,200′. Season: usually late November through April. Night skiing Weds-Thu-Fri. Annual Snowfall: 120″. Snowmaking: 75%. The SKInny: Here’s another “local” operation, situated just a few minutes from the middle of nowhere, saved from decay and abandonment by The Maine Winter Sports Center and a grant from the Libra Foundation. Whoever these people are, they deserve the eternal gratitude of the entire ski community. This was already a great little area; they’ve subsequently added a chair and are now a mid-sized ski area with an awesome continuous pitch. Do know that this hill turns out some serious ski racers, and we haven’t even begun to talk about the cross-country facilities, which are second to none for XC racing. As for the alpine skiing, the ticket price makes it easily the best value in the eastern United States. Specs: Summit Elevation: 1100′; Base Elevation: 150′. 3 Lifts: 1 double, 2 T-Bars, 1 handle tow. Uphill Capacity: 2,000/hr. Terrain Mix: 15-80-5. Longest Run: 5000′. Season: usually mid/late December through Mid-March. Annual Snowfall: 50″. Snowmaking: 45%. 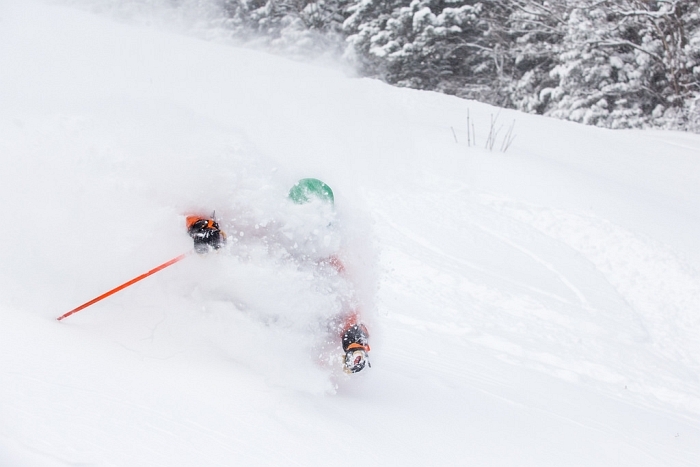 The SKInny: Don’t look for too many “powder days” at Camden Snow Bowl. The skiing is as blustery and rocky as the coast of Maine, which is where it’s located. But then again, when the wind dies down and the sun shines, wow…Camden is like no other ski area. The highlight is the outstanding view of the Atlantic Ocean and Camden harbor, right at your feet. One of the best “approaches” in the USA. The trails are nice, classic New England, with some decent pitches here and there. Signature Trail: None. The clam chowder, however, beats any other ski town on the planet. Specs: SKIING HAS RESUMED! Summit Elevation: 700′; Base Elevation: 80′. 1 double chair. Uphill Capacity: 840/hr. Terrain Mix: 25-40-35. Longest Run: 7920′. Season: usually late November through late March, sometimes April. Night skiing. Annual Snowfall: 72″. Snowmaking: 100%. The SKInny: If this were located anywhere else, it would be out of business. Thank goodness Eaton is located in Maine, where stubborness beats common sense every time. The deck has been stacked against them with lift issues, a groomer accident and an aging infrastructure. But Eaton presses on and re-opened with snowtubing a couple years ago. As of 2018-19 Eaton Mountain has reopened for downhill skiing on the lower portion of the hill served by two ski tows, dubbed the “Lower Bowl”, Tow 1 is a 700 ft handle tow that runs up as high as the old rope tow (120 ft of vertical) and serves intermediate. Tow 2 is a modern rope tow and serves a gentle and protected beginner slope running 330 feet from the lodge up the bottom of the Fawn trail. They’re making snow on all the terrain served by these two lifts. Word has it that they’re trying to figure out a way to get the chairlift running again, and may have an earn-your-turns policy for the upper mountain by the time you read this. Let’s keep supporting this place, and look forward to top-to-bottom skiing sometime in the future. There’s a great brewery nearby, so you’ve got no excuses. Specs: Summit Elevation: 450′; Base Elevation: 100′. 3 Lifts: 1 double, 1 t-bar, 1 handle tow. Uphill Capacity: 2200/hr. Terrain Mix: 40-30-30. Longest Run: 5000′. Season: usually December through late March, sometimes April. Night skiing Annual Snowfall: 90″. Snowmaking: 100%. The SKInny: Here’s another classic Maine ski area. Smallish, uncrowded, nobody outside of Maine seems to know about it, and the people who do prefer it that way. Somehow they manage to continually upgrade, add new, improve, etc. Smallish, fun hill. Specs: 3 Lifts: 1 rope tow, 2 t-bars. Uphill Capacity: 1600/hr. Terrain Mix: 33-43-33. Longest Run: 3696′. Season: usually late December through late March. Annual Snowfall: 75″. Snowmaking: none. The SKInny: You want the real deal? Here it is. Old, narrow, gnarly trails. Questionable cover, t-bars to the top. Low ticket prices, great views. In other words, your average small Maine throwback ski area, which is to say, it’s awesome. Specs: 2 Lifts: 1 t-bar, 1 j-bar. Terrain Mix: 5-55-35. 50% snowmaking. Night skiing Wednesdays and Fridays. The SKInny: This is the northernmost U.S. ski area on the east coast; other than Vermont’s Jay Peak, Lonesome Pine Trails is one of the few with a close, panoramic view of Canada. Note that it is only open Wednesdays and Fridays (with night skiing), Saturdays and Sundays, and school vacation days. This is like any other good community ski area, with an emphasis on intermediate and expert skiing. It’s right in the town of Fort Kent`and is positively a fun place to be. For those unfamiliar with the area, Fort Kent frequently plays host to World Cup Biathlon, on trails that connect to Lonesome Pines. How cool is that? Specs: Summit elevation: 491′; Base elevation: 255′. 2 doubles. Uphill Capacity: 3300/hr. Terrain Mix: 30-50-20. Longest Run: 2500′. Season: usually December through late March. Night skiing. Mon-Sat. Annual Snowfall: 99″. Snowmaking: 100%. The SKInny: Small, comfortable ski area for the small, comfortable, uh, “cities” of Lewiston and Auburn. At 3:00 pm it’s packed with school kids, learning to ski, hanging out, flirting…all the things they should be doing. Interesting “mountain,” flat on top, a mild glade, a couple of tough trails. Specs: 2 rope tows, racing program. The SKInny: Pinnacle Ski Club is a membership-based association that promotes the sport of skiing for young and old alike, and operates this terrific little tow. Specs: 800′ rope tow, no snowmaking. Novice/Intermediate ski hill with beginner terrain and some steeps and glades mixed in as well. Open Wed & Fri 7 pm -9 pm, Sat & Sun noon til 4 pm. The SKInny: Classic town tow. Opened in the late 1930s, this is New England community skiing at its best. Run by local volunteers. Powderhouse Hill also has a sledding hill, which makes it a terrific place to spend a winter’s day. They even do some grooming here. At five bucks a pop, lift tickets are cheaper than a Maine blueberry pie. Look, if you’re in the area, you’ve no excuse for not stopping by and making a run at Powderhouse. Located at the intersection of Route 4 & Agamenticus Road. Specs: 1 t-bar. Terrain Mix: 40-60-0. No snowmaking. The SKInny: This is a small community ski area with no challenge whatsoever. So why do we like it? It may have something to do with the Maine Winter Sports Center keeping little tows like this alive. Or maybe we have yet to find a better way to spend a winter day than skiing for six dollars. If you left your equipment at home it’s another twelve dollars…hardly worth turning the car around. Keep your big crowds and fancy outfits; this is what skiing is supposed to be. Besides that, Quoggy Jo has a hand painted penguin sign that’s just about the coolest thing anywhere. Saddleback, Rangeley • 100 skiable acres on 1700′ vertical. Specs: Summit Elevation: 4120′; Base Elevation: 2460′. 5 Lifts: 1 quad, 2 doubles, 2 t-bars. Uphill Capacity: 4200/hr. Terrain Mix: 32-34-34. Longest Run: 16,368′. Season: usually mid December to April. Annual Snowfall: 186″. Snowmaking: 85%. The SKInny: OPERATIONAL STATUS UNCERTAIN — CURRENTLY CLOSED Saddleback didn’t open 2015-2018, and it’s not going to open this year. Big mountain, steep narrow trails for experts, no liftlines. It’s a distant third in popularity behind Sugarloaf and Sunday River, simply because it doesn’t have nearly as much skiable acreage or a lot of clocktower village claptrap. For purists, it should be first choice. Hotshots have their work cut out for them; wanderers are better off at Sunday River. For the rest of us, the big mountain vertical and the appallingly short liftlines (on weekdays) are tough to pass up. Note that the upper, main ridge at Saddleback is mostly for pedal-to-the-metal experts and is presently only serviced by a platter pull. The rest of the place is suited to average skiers: Pure classic New England skiing with plenty of variety. The short section below the lodge is dreadfully flat; do it once and unless you’re a novice, you won’t be anxious to do it again. This is a big, big ski mountain. Whatever the future might bring, Saddleback is a terrific ski area, not to be missed. If it reopens. Shawnee Peak, Bridgton • 225 skiable acres on 1300′ vertical. Specs: Summit Elevation: 1900′; Base Elevation: 600′. 5 Lifts: 1 quad, 2 triples, 1 double, 1 carpet. Uphill Capacity: 5600/hr. Terrain Mix: 15-55-30. Longest Run: 7,920′. Season: usually December through March. Annual Snowfall: 110″. Snowmaking: 99%. Night skiing Monday – Saturday. The SKInny: Formerly Pleasant Mountain, Shawnee is the oddball in the Maine mix…more like a New York metro ski area such as Windham or Hunter; some even compare it to nearby Cranmore. Night skiing, modern equipment, two bases, etc. Trails are fairly wide, although there are some narrow trails as well. Little known aspect is that one side of the lower intermediate trails are often left to bump up. This is a nice opportunity for developing skiers to experiment with bumps on trails that aren’t steep and nasty. Hotshots and wanderers will be semi-happy here. Some trails up high on the mountain can be prone to ice. All in all a very good ski area that seems to be well run. Spruce Mountain Ski Club, Jay • Approx. 20 skiable acres on 300′ vertical. Specs: Summit Elevation: 900′; Base Elevation: 600′. 4 rope tows. Terrain Mix: 27-46-27. Snowmaking: 50%. The SKInny: Local tow, run by the town of Jay. Nice bit of pitch to the primary slope, some 9 trails are listed but have no idea what they are. Good junior racing program, excellent recreation here for the community. If you’re in the neighborhood, stop by and make a few runs. Sugarloaf, Carrabassett Valley • 1,400 skiable acres on 2820′ vertical. Specs: Summit Elevation: 4237′; Base Elevation: 1417′. 15 Lifts: 2 Quads, 2 High-Speed Quads, 1 Triple, 8 Double Chairs, 1 T Bar, 1 Handle Tow. Uphill Capacity: 21,805/hr. Terrain Mix: 27-29-44. Longest Run: 18,508′. Season: usually Thanksgiving weekend through April. Annual Snowfall: 240″. Snowmaking: 92%. The SKInny: Sugarloaf, called “The Loaf,” is a little bit of western skiing in the east. Sort of. The Snowfields and most of the upper runs deliver thrills for skiers of even the most advanced ability. Vertical is bigger than Taos, Crested Butte, and quite a few other well known resorts. It’s wicked cold, however, and sometimes has a certain ski condition not often found in Colorado…rock hard New England ice. But we nitpick. Sugarloaf is one of the finest ski areas in the world. Lines are a fraction of those found at other big resorts, lifts are hidden all over the place. Snowmaking is phenomenal; 48,000 pounds in sixty seconds when all guns are brought to bear. Sugarloaf is the best of the best of eastern skiing. Sugarloaf’s face is concave; the top is steep, the bottom is gentler, there’s a transition somewhere in the middle. Although the trail mix percentages appear to favor experts, there is so much mountain here that everybody will find more than enough to do. This is the bigtime on the east coast. Wanderers, hotshots, families, you name it. It’s a big, big ski area. Be aware that when you approach Sugarloaf for the first time in your life, you will go around a certain bend in the road and say “oh my gosh…” We hesitate to say that this is the best ski area in the east, but we’ve yet to find a better one. Opening some new side terrain for 2011; the best gets better. Signature Trail: Narrow Gauge (site of 1971 World Cup), also Bubblecuffer, White Nitro. Sunday River, Newry • 663+ skiable acres on as much as 2340′ vertical. Specs: Summit Elevation: 3140′; Base Elevation: 780′. 18 Lifts: 3 High-Speed Quad, 1 Quad/gondola combination lift, 5 Quads, 4 Triple, 2 Double Chairs, 3 Handle Tows. Uphill Capacity: 32,000/hr. Terrain Mix: 33-36-31. Longest Run: 15,840′. Season: usually Mid November through April, sometimes May. Annual Snowfall: 155″. Snowmaking: 92%. The SKInny: If it looks like a duck, walks like a duck, quacks like a duck…if Sunday River appears to be Maine’s version of Killington, well, that’s because it was Maine’s version of Killington. Revitalized by Les Otten, SR was the cornerstone of American Skiing Company, a once mighty machine that ruled the eastern ski world in the 1990s. Otten positioned SR to compete with K-Mart…then wound up buying K-Mart. Eventually it all fell apart, ASC fell apart, and the people who own Boyne now run SR. They know how to run ski resorts; they just aren’t as colorful as ol’ Les. Anyway, on to the skiing…SR can be crowded, but the crowds tend to be on the green trails and not on the liftlines. Biggest difference between it and K-Mart is that there are plenty of groomed intermediate cruisers at Sunday River. And even though it is spread out like Killington, it requires less traversing, with fewer narrow trails and funnels. Although if you’re a fan of traversing, you can do more at the Riv than almost anywhere else…it’s just not required. The snarky nickname for the Riv is “Someday Bigger,” but the fact is it lacks for nothing. You want long runs? nasty tree runs? steeps? traditional narrow New England? Sunday River has it all. Les may have set out to mimic Killington, but in the end, I sort of think he surpassed it. Back on topic…Sunday River offers an incredible variety of terrain, on five mountains (they say eight, it’s such a big place and so confusing that there might actually be nine or ten mountains involved) so the wanderer will love it — maybe wind up lost. With pricey tickets, plan to spend the entire day. You won’t be bored. Be prepared to enjoy some of the best eastern skiing, as well as some of the worst: Hotshots love this place, as do the out-of-control skiers and boarders, and zillions of novices skidding slowly in unpredictable directions. But again, it’s so darn big, none of that really matters…you’ll have no trouble finding outstanding skiing if you aren’t anchored to the easy trails. Sugarloaf may have the best vertical in the east, but Sunday River rules when it comes to horizontal. And really, this place feels more like a western ski area than many in the east. It’s huge. The tickets are pricey, but with some effort you can easily get in 20 legit runs thanks to a sprinkling of high speed lifts. I like to say that Sugarloaf rules the east, but honestly, there are some days that Sunday River has it beat. You will gulp when you buy those tickets, no doubt about it. So target the Riv for a weekday when you can commit to really working it, and that high ticket price becomes a bargain. Signature Trail:White Heat; also any of the stuff on Oz. Titcomb Mountain, West Farmington • 45 skiable acres on 340′ vertical. Specs: Summit Elevation: 750′; Base Elevation: 400′. 2 t-bars, 1 handle tow. Uphill Capacity: 1,440/hr. Terrain Mix: 30-40-30. Longest Run: 2,200′. Season: usually Mid December through Mid March. Annual Snowfall: 110″. Snowmaking: 75%. Night skiing. The SKInny: This is a great example of a community ski area. With tickets under ten bucks, you just can’t go wrong. As local tows go, it’s one of the few where advanced skiers won’t be immediately bored out of their minds. Great hill all the way around. Park’n’pipe crowd even has a slope, complete with an upside-down boat to jib on…how can you beat that? It also boasts a skating pond and a fabulous cross-country area. We honestly wish every community had a place like this. The lodge is old, homey, warm, comfortable. Stop here and make a few runs, grab a coffee, check out the old ski stuff displayed in the lodge. If you don’t like Titcomb you ought to come down off your high horse and get a reality check. Like all these little Maine areas, the local folks who run this place are number one in our opinion, and as ski enthusiasts, we thank them with all our hearts for keeping the sport alive at venues like this one. • Current Maine Snow Totals Map of snowfall during the past 24 hours, as well as a map of actual current natural snow cover. • SkiMaine.com here’s a consortium type website comprised of most of Maine’s ski areas, good for news, ticket and conditions information…excellent resource.